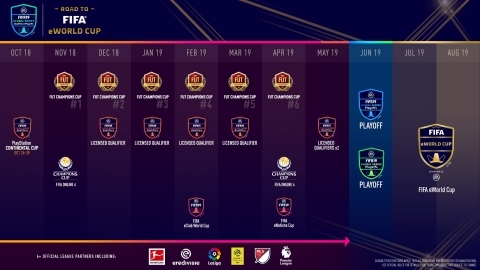 REDWOOD SHORES, Calif. & ZÜRICH--(BUSINESS WIRE)-- Electronic Arts Inc. (NASDAQ: EA) and FIFA announced the EA SPORTS™ FIFA 19 Global Series* tournament schedule illustrating the mass player journey all will take on the Road to the FIFA eWorld Cup 2019. *Eligibility restrictions apply. See Official Rules and FUTChampions.comfor details. Final terms and structure subject to change.